Brothers and sisters, Come join us for an explosive evening of emuna and song that will B’ezras Hashem have your heart bursting with flames of yearning and love to Hashem. A soul igniting lecture by The English translator of International Bestseller ‘Garden of Emunah’ by Rav Shalom Arush, Rabbi Lazer Brody, Hashem’s English speaking representative of Emuna, will help break down the barriers of your heart ,that keep you imprisoned in your personal galus (exile), and will help you get close to hashem in an intimate way. 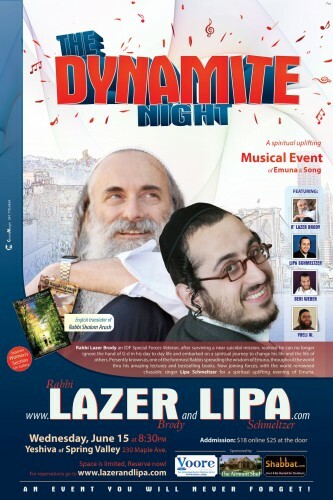 Lipa Schmeltzer, the Chassidic star who keeps true to the mission of the holy Baal Shem Tov by encouraging the ‘Poshiter Yid (simple jew)’ with his sweet music, will burst open the thick chains that keep your soul hostage, with songs of love to yiddishkeit and Hashem.